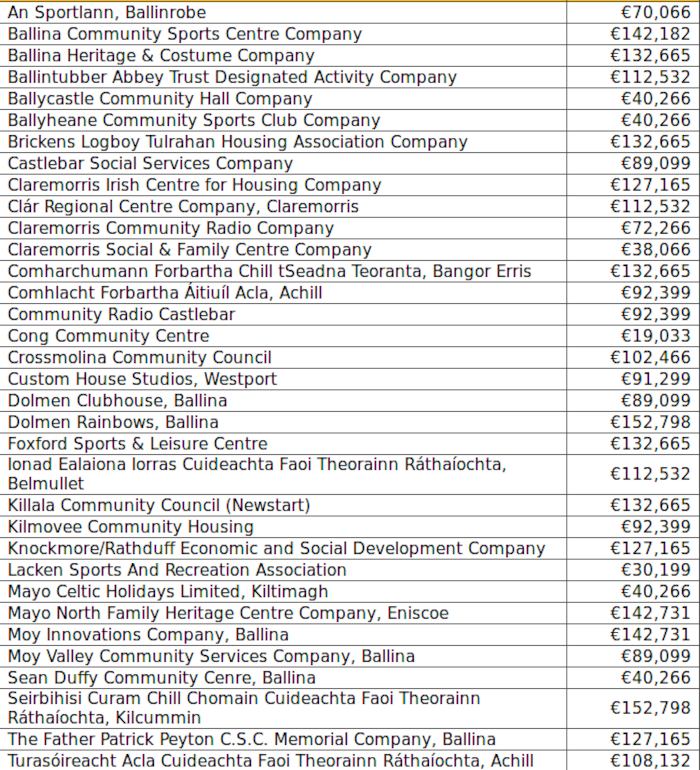 The organisations who have received the funding. Michael Ring TD, Minister for Rural and Community Development, has confirmed that 34 Mayo community organisations are set to receive a total of €3,352,741 through his Department’s Community Services Programme (CSP ) in 2019. The CSP currently supports community-based organisations to provide vital services by providing a contribution towards the cost of their staff. Minister Ring said: "This funding, which I have allocated to 34 community organisations across Mayo, will support invaluable work in local communities throughout the county. It is a lifeline for groups that support vulnerable and disadvantaged people within our county. "The CSP provides a contribution towards the cost of staff to community-based organisations which provide a wonderful service to people across Mayo. This funding enables organisations to provide access to services and facilities that would otherwise generally be unavailable. Funding is provided to community organisations as a fixed contribution towards the cost of employing a manager and/or an agreed number of full-time equivalent positions (FTEs ). Minister Ring continued: "I have recently appointed Indecon Consultants to carry out an independent review of the programme as no formal review has been carried out since it began in 2006. A formal review will ensure the programme is more closely aligned with current department and Government policy and better placed to meet community needs." Page generated in 0.1615 seconds.